I had a bunch of leftover oils lying around – half a bottle here, third of a bottle there, that type of thing. So, I thought I should use up all these lousy half empty bottles once and for all in a batch of soap. Turned out nice! And I learned that canola oil is a good substitute for olive oil, and safflower oil is extremely similar to sunflower oil. 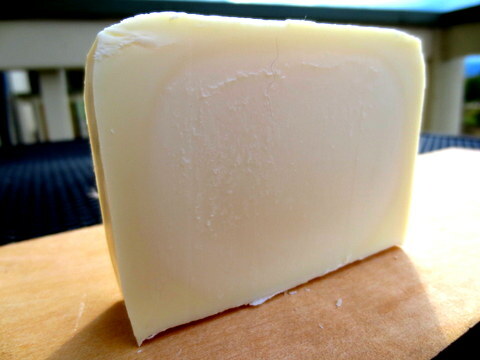 You should limit the amount of safflower/sunflower oil in your recipe to not more than 25%, otherwise the resulting bar soap is very soft (mushy and hard to unmold). The below recipe makes about 5 lbs of soap. I used my long wooden mold. *All measurements are weight measurements, not liquid measurements. In a heat-safe container, add lye to your water, stir, set aside to cool to about 110F. It took about an hour or two for the solution to come down from 160 F.
In a separate container, melt and combine the base oils. I like to break up the hard cocoa butter into small chunks so that it melts more evenly. It will melt around 130-140F. This step takes hardly any time, especially if you use a double boiler. When the lye water is about 100-110F (within 10F of the oils), pour the lye water into your base oils and blend with a stick blender. After a few pulses with the stick blender, add the mica powder, the clay, and the Annatto seed powder. Pulse a few more times to incorporate the powders. Stir in every essential oil EXCEPT THE CLOVE OIL by hand. If you use the stick blender, do so with caution! You may accelerate trace. After your hand stir it well, blend with the stick blender. Fold the clove oil into the mixture. I left the clove oil for the last step because it is a spice oil, which is known to rice soap if it is agitated with the stick blender. Pour in your mold, and allow to sit for 1 day. Unmold, cut, and cure for 6-8 weeks. This recipe made a lot of lip balm, but I wanted to make 13 tubes of it only… And the lavender scent is not very strong, which is a little disappointing. Next time: less butter/oil, more scent. But this was a good start, and the lip balm will be very nourishing and natural! *all measurements in ounces are weight, not volume. In a double boiler, melt the wax, butter, and oils in a small container (glass or metal). Once the mixture is completely melted (around 160 F), add the essential oil. Turn off the heat, but leave the oils in the hot water. Otherwise, it will start to solidify as it cools. With a pipette, pipe the oil mixture into lip balm tubes. I put a rubber band around all 13 of the tubes to hold them in place. Allow them to cool completely before capping them. Making soap in the winter is so nice. The home is warm and cozy, and then you crank open a nearly frozen shut window to release the noxious lye fumes. No, really… it’s nice. The chilly air helps the lye cool faster! I bought a bunch of cocoa butter on sale recently, and I’m using a ton of it in this recipe. I also tried my new flower silicon soap mold. It worked perfectly. The below recipe makes about 5.5 lbs of soap. I used my long wooden mold, one circular silicon soap mold (six 4 oz bars) and one flower silicon soap mold (six 3 oz bars). In a heat-safe container, add lye to your water, stir, set aside to cool to about 100-110F. In a separate container, melt and combine the base oils. I like to break up the hard cocoa butter into small chunks so that it melts more evenly. It will melt around 130-140F. After a few pulses with the stick blender, add the mica powder and the clay. Just before the soap traces, stir in the essential oils by hand. If you use the stick blender, do so with caution! You may accelerate trace. You can tell the soap hasn’t completely cured yet. The inner part of the soap is still quite moist. This is my first Castile soap. 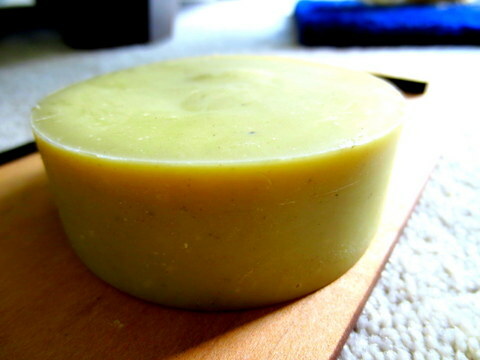 Castile = pure olive oil soap. I’ve heard that it’s a luxurious and gentle bar of soap, after it cures for 6-8 months. Castile soap recipes are different than regular CP soap recipes. First, you must apply a water discount (Yikes, that means the concentration of lye is much higher – in the neighborhood of 40%). Second, you mix the EO with your base oil before adding lye. Third, the cure time is 3-4 times longer. This recipe is for five pounds of soap. Make sure you follow all the general safety precautions for making soap before you start. In a heat-safe container, add lye to your water, stir, set aside to cool. Be very careful not to spill, as this is a highly concentrated solution of lye. Keep some white vinegar nearby for an emergency neutralization. When the lye solution is close to 110F, set up a double boiler. Gently heat the olive oil to about 100F. Combine the EO and olive oil. Carefully pour the lye water into the oils. Gently stir with a heat safe rod. Pulse the stick blender in the mixture a few times, and then gently blend until you reach trace. Pour in the mold, and wait 1-2 days before cutting. My older sister just got married this summer, and I’m so happy for her. 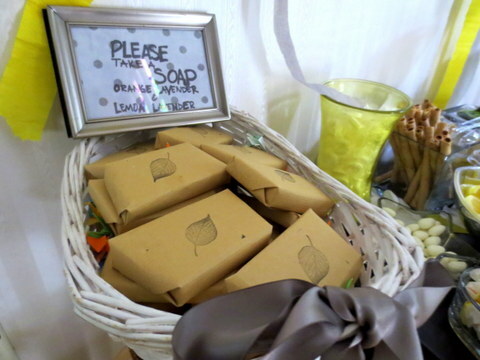 Of course, I made a special batch of soap for party favors! The options were: orange lavender or lemon lavender. 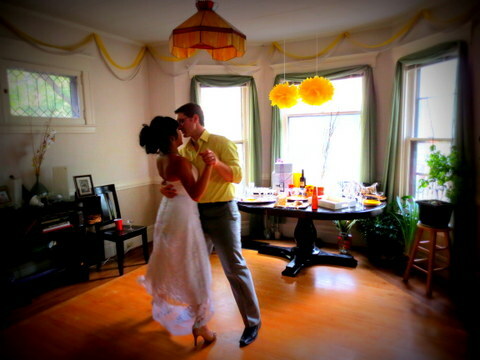 She had an adorable, intimate ceremony in her new home with close friends and family. I’m trying to get rid of the last of my palm oil so that I can consistently make palm-free soaps. 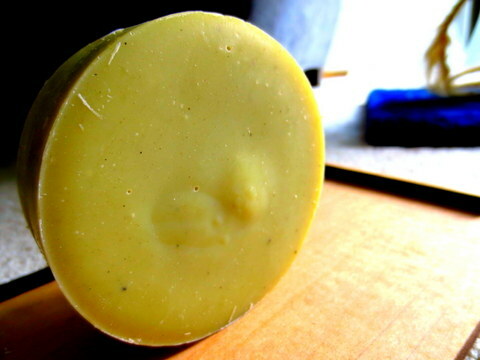 Bentonite Clay adds a greenish tinge to the soap. It looks very nice. This recipe makes six 4 oz bars of soap. In a heat-safe container, add lye to your water, stir, set aside to cool. In a small bowl, combine essential oils. Set aside. In a separate container, combine the base oils. Heat to about 120-130F. When the lye water is about 130F (within 10F of the oils), pour the lye water into your base oils and blend with a stick blender. Just before trace, add the EO blend and clay. This palm oil free soap is very similar to my last palm free soap, except that I’m using safflower oil in place of castor oil and a sightly different percent composition of base oils. This recipe makes twelve 4 oz bars of soap. In a separate container, combine the base oils. I like to break up the hard cocoa butter into small chunks so that it melts more evenly. It will melt around 130-140F. When the lye water is about 130-140F (within 10F of the oils), pour the lye water into your base oils and blend with a stick blender. Just before trace, add the EO blend, buds, colorant, and clay.